Do you have one of those pieces of kitchen equipment that you only use when you have to? For me, it’s a mandolin. It’s difficult to clean, it’s awkward to use, and every time I touch it, I think I’m going to end up with one less finger by the time I’m finished. Of course, the fact that I have a cheap (in the negative sense of the word) mandolin probably has more than a little to do with it. Regardless, I seldom get it out – unless I absolutely have to. We went to a party this weekend. One of us (not me) ended up having a little too much fun and was paying for it the next day. I hate days like that. I can certainly empathize with anyone who wakes up because they hear the ants crawling outside the bedroom window (I’ve been there once or twice myself). In an effort to combat the remnants of an exciting evening, Don had requested something starchy but light for dinner (yes, he was still not himself by dinner time – he thought it was a really good party). Starchy but light? I threw out a few ideas, but each one made his face a little darker shade of green. Then he mentioned potatoes. Finally a light went off over my head – potato torta! It’s light with a little crunch on the outside and a creamy center on the inside. Great idea – except for that stupid mandolin. You see, the key to a good torta is thinly and uniformly sliced potatoes. That means dragging out the mandolin. I wasn’t in the mood to fight that thing (plus I’d been at the party the night before as well, and my manual dexterity was a little in question), so I started playing with other options to create the starchy but light. I ended up grating the potatoes instead. I figured that would get me close to the texture I was after. Whenever I grate potatoes, I always wring out the excess moisture. Try it sometime – you’ll be surprised how much water a potato holds (just use a tea towel that you don’t want to display because the potato starch will leave a nasty stain that doesn’t go away). Besides, potatoes brown up much nicer when you eliminate all that moisture. I also made sure to use a smaller than average pan so I could get a certain level of thickness in the potatoes and create the creamy center I was after. I was about to finish up the dish when I realized that the mushrooms would just roll around without a little glue to hold them in place. Luckily, I had some cheese that would do the job just fine. Besides, when did a little cheese ever hurt anyone? I paired this with a little bit of green salad, and it turned out to be a fine meal. The mushrooms give it some meatiness that rounds out the crispy/creamy potatoes. There’s just enough flavor from the rosemary to compliment everything, but not overpowering (like rosemary can be). I think this would also work fantastically as an accompaniment to beef – or better yet, lamb. And the nice thing is that you can change up the flavors to go with any dish you’d like. So go ahead and create your own torta reform. The perfect hearty side dish - or a light meal all on its own. Preheat 2T olive oil in a 10” nonstick sauté pan over medium high heat. Add mushroom and dried thyme. Sauté 6-8 minutes, stirring occasionally, until mushrooms are browned. Add salt & pepper (to taste) only after the mushrooms are finished. Remove from pan and reserve. While mushrooms are sautéing, place grated potatoes into a tea towel and squeeze all excess water out of potatoes. Transfer potatoes to a mixing bowl and add remaining olive oil, garlic, rosemary, scallions, salt and pepper to taste. Add potatoes to the same sauté pan after mushrooms are complete. Press lightly down on potatoes to create a uniform thickness. Sauté 6-8 minutes on the first side, until potatoes are browned on bottom. Flip the potatoes (in a single disc). Once the potatoes are cooking on the second side, sprinkle shredded cheese over the top. Add mushrooms and spread evenly across the top. Sauté potatoes 6-8 minutes on second side, until nicely browned on bottom. Remove from pan onto cutting board. Sprinkle top with chopped parsley. Let sit 5 minutes before cutting. This post was reblogged from my earlier site, Inexpensive Eating. 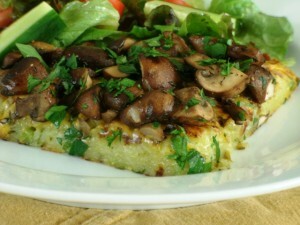 This entry was posted in Cooking and tagged dinner, mushrooms, potatoes, side dish, vegetarian. Bookmark the permalink. Just a note to thank you for our sink issue. We do appreciate the professional way you handled the problem. At a time when many business and service people just don’t seem to care once the ‘job is done’, it is refreshing to find people like you. Please feel free to use us as a reference anytime.